Published on 29 December 2007. Even days after the assassination of Benazir Bhutto, the impact for the homeland she loved so dearly is still far from clear. The tragedy of her death is certain: A 54 year-old who had spent much of her life fighting for true citizen-led democracy in Pakistan silenced not through reasoned argument but through mindless violence. The first female leader of an Islamic nation in modern history killed whilst trying to improve life for her fellow citizens. Her three children left without a mother, her husband without a wife. I only hope that the violence of the last two days in Pakistan is short-lived, and that people will continue in her tradition of arguing eloquently, powerfully, and persistently for true representation of the people of Pakistan and against dangerous extremism. 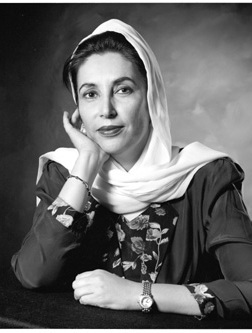 A full and detailed obituary for Benazir Bhutto is available on Guardian Unlimited or BBC News. This 1,242nd post was filed under: News and Comment.